My little guy, Dax’s birthday is right around the corner. It’s hard to believe that my baby will be four! Time flies when you’re having fun as they say. As a mama, it’s such a joy to watch your kids grow and see their personalities develop. One of the things I am most proud about with my boys is their kind, giving hearts. Something I really enjoy about the community that we live in is how other people look for ways to give and bless others. That’s a culture that’s important to me to establish in my own family and I strive to teach that to my boys. I’m partnering with Evite today to talk to you about the joy in giving. 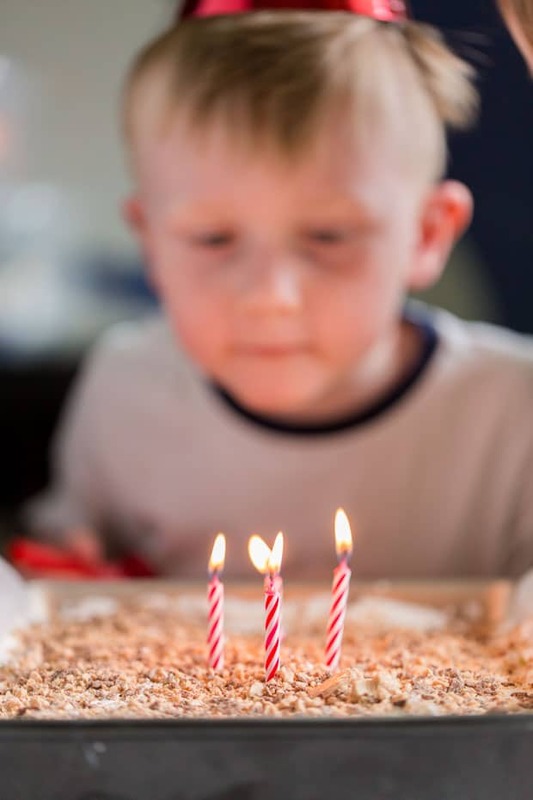 Today, we’re talking about birthday celebrations — which is how Spaceships and Laser Beams first started! 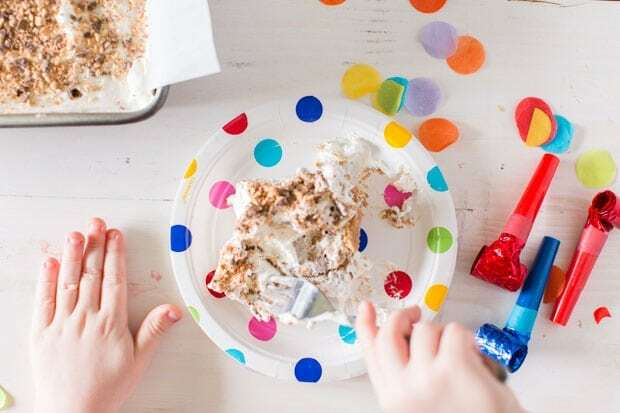 As someone who loves to throw a great shindig, I’m all about Evite — they’re the go-to service for all of us moms and party planners. Evite Donations, powered by Pledgeling, is a free tool that turns every Evite event into an opportunity give back. In it’s first year, Evite Donations has been part of more than 20,000 events and guests have helped raise over $5 million to date for charities nationwide. Amazing! You can easily add donations to your invitations by selecting your favorite non-profit from 10,000+ choices or recommending a new non-profit to be added. Your guests can donate without leaving Evite.com and Evite never charges a fee to make donations. 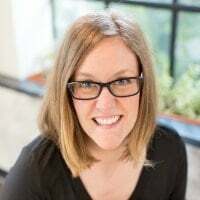 Because giving back is so important to me, when I heard about Evite’s Birthday Hero program, I was immediately impressed. Their first Birthday Hero is a 13 year old named Olivia. She is giving back to others in a big way. She has started an organization that focuses on creating “birthdays in a bag” for kids that are less fortunate than her and haven’t gotten to experience the joy of celebrating a birthday party. Using Evite Donations, Olivia donated her birthday to help others. Wow! She’s 13. We can all find ways to give back to others, no matter our age. After hearing Olivia’s story, I started a dialogue with Rowen and Dax. We talked about how blessed we are and ways we can give back to others. I loved hearing their suggestions! Kids really do have incredible ideas when we pause long enough to listen. 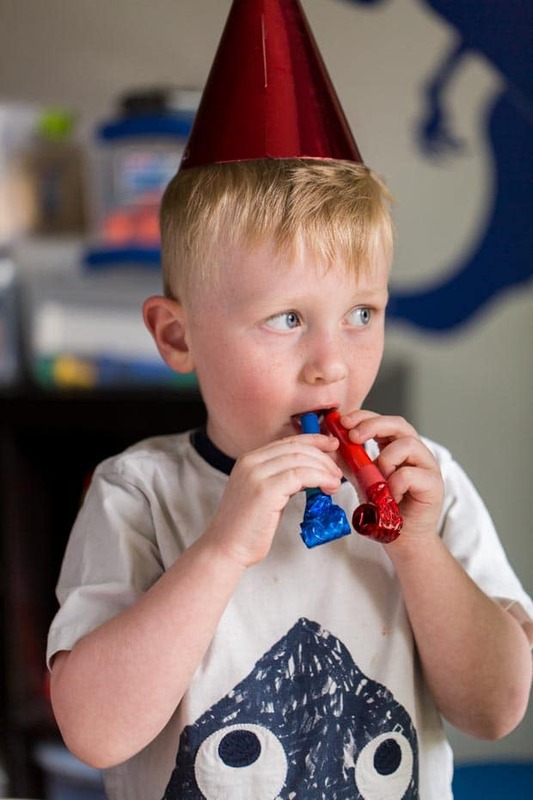 The conversation got me thinking about Dax’s upcoming birthday as well. Birthdays don’t need to be all about receiving the latest and greatest – it’s about celebrating a person and creating those special memories. That’s something I want to focus on this year and not worry about gifts at our gathering. I want my boys to understand the importance of giving back to others. 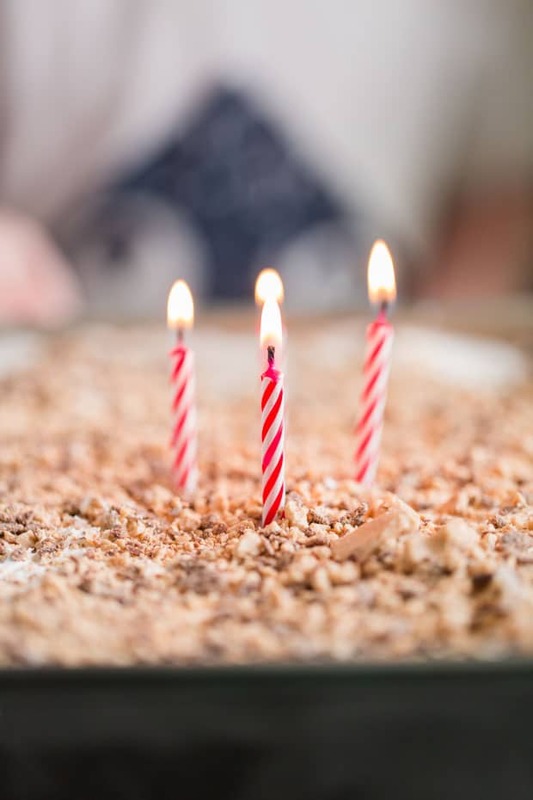 Evite is celebrating their own 20th birthday this year and they’ve got great invitations available to help you gather your tribe for your event. I’m especially enjoying their heroes theme! Along with a great invitation from Evite, you’ll love this delicious cake recipe I’m going to be sharing with you. It’s incredibly easy and very tasty! And it’s a great alternative to a traditional birthday cake too! 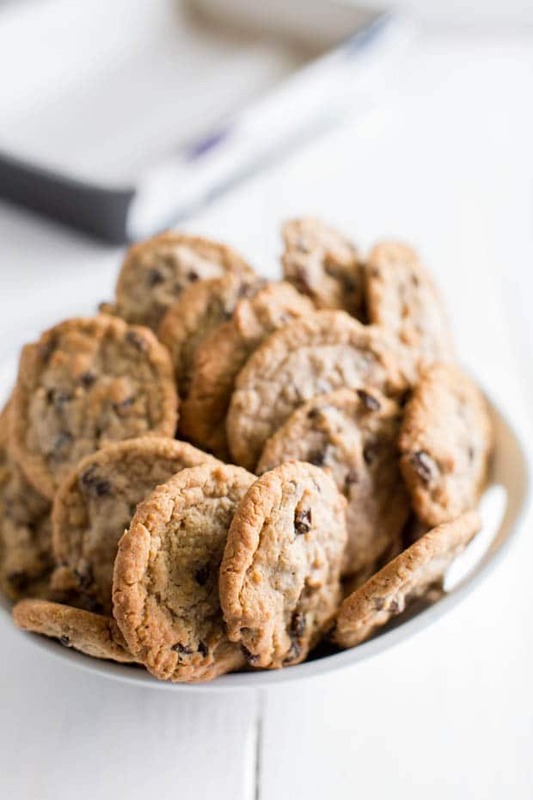 For starters, you’ll need oatmeal raisin cookies. I purchased store bought (I used about 30 for this recipe) but you could definitely make them homemade as well. You’ll also be using milk, whipped topping and chocolate covered toffee bars. Putting this together is so easy, especially if you use the store bought cookies! 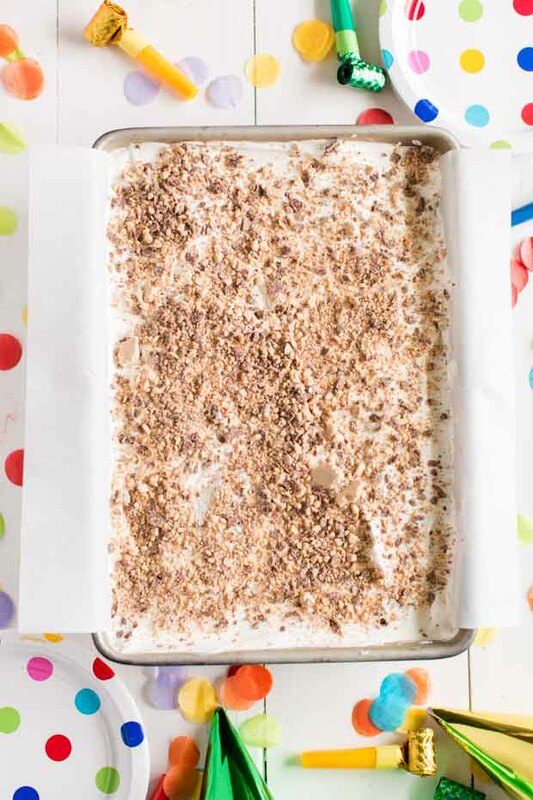 You’ll start by lining a 9×13 metal cake pan with parchment paper. Next, spread a layer of whipped topping over the top of the cookies. Repeat those steps by adding another layer of the milk dipped oatmeal cookies and whipped topping until the pan is full. Sprinkle with crushed chocolate covered toffee bars and freeze for four hours. You’ll want to take it out and let it sit at room temperature for about 5-10 minutes before serving. 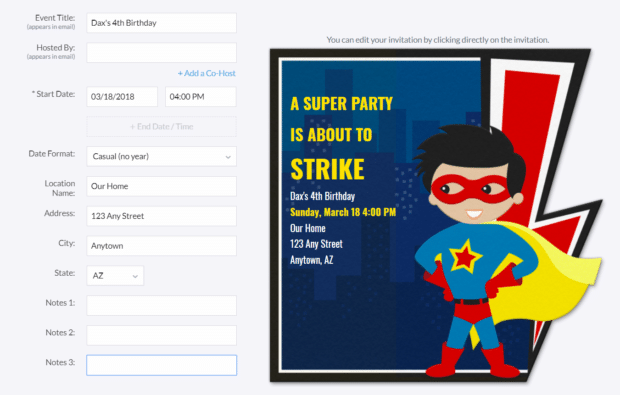 Prepare to celebrate someone special in your life with help from Evite now… and lead those around you in becoming heroes to someone in your community! This simple cake is so easy to put together, requires no baking and is delicious! 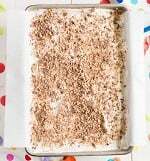 Line a 9×13 metal cake pan with parchment paper. 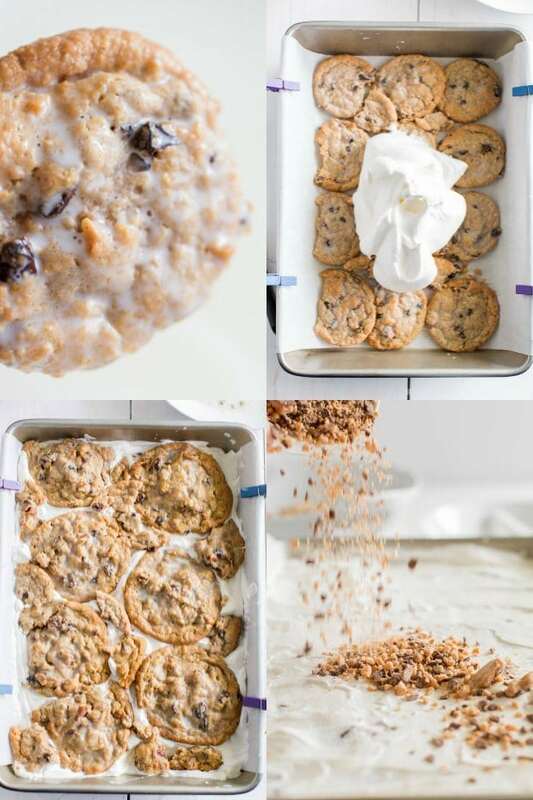 Dip the oatmeal cookies in milk and then line the bottom of the baking pan. Spread a layer of whipped topping over the top of the cookies. Add another layer of dipped oatmeal cookies, then spread with more whipped topping. Add the last layer of cookies and whipped topping. Sprinkle with crushed toffee bars and freeze for 4 hours. Let sit at room temp for 5-10 minutes before serving. Will try this on my daughters birthday. made it! holy heck, got gobbled up SO FAST! Have you tried it with chocolate chip cookies? No, but I bet it would work and be delicious as well! That’s what I am going to try…Don’t like oatmeal raisin, so chocolate chip it is! I’m with you kellie . Cc cookies sound good to me. I so need to try this just out of curiosity!!! What size container of whipped topping?